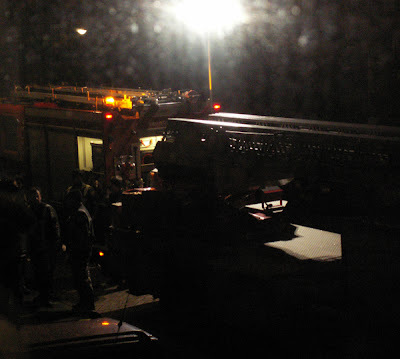 About 3 to 4 o'clock in the morning I woke up hearing hard compressor noise looked out of the window and saw firefighters. When I went outside, the fire was already out. 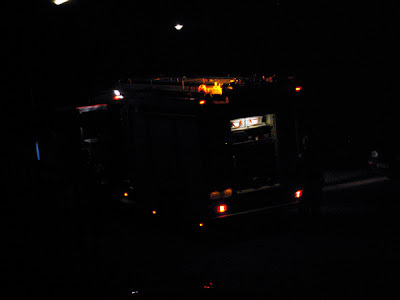 However I managed to take few picture from the living room window of the firefighters. 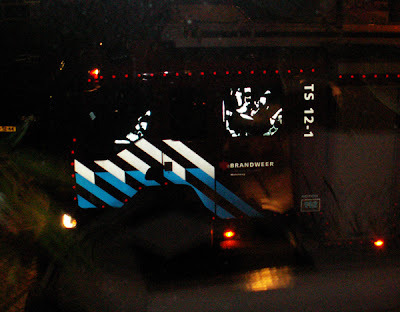 But I should have gone outside to photograph so I wont have the trouble of reflections from the windows. I found out that its hard to get good light picture of them because of its really dark and a slow shutter time is very hard to hold the camera still. So had to compromise it, so that I could still get a sharp picture. Something not to do is to use flash lights as you can see the flashlight reflects very bright from the reflector paint and clothing parts. But it does give a very cool effect. Click full post to see the rest of the pictures. Also there using a very bright light to help them to look better at the building. But cause of the light its very hard to get a bright picture. I managed to make a small panorama picture from out of the living room window. Around 5 to 6 o'clock they went away so haven't got real good sleep from this though. 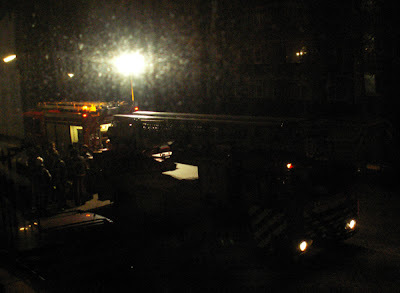 However the firefighters did not said to the people to evacuate the building. But I am not sure if its a small fire or what, because they said nothing. There were 3 firefighter vehicles, a cop car and a ambulance. But don't think this would get into the local papers though.